Restorative dentistry encompasses many different forms of oral surgeries and procedures, from replacing missing teeth and repairing those that are damaged to inserting dental implants and performing root canal treatments. With so many things falling under this umbrella, not many people outside the medical community know what restorative dentistry entails. 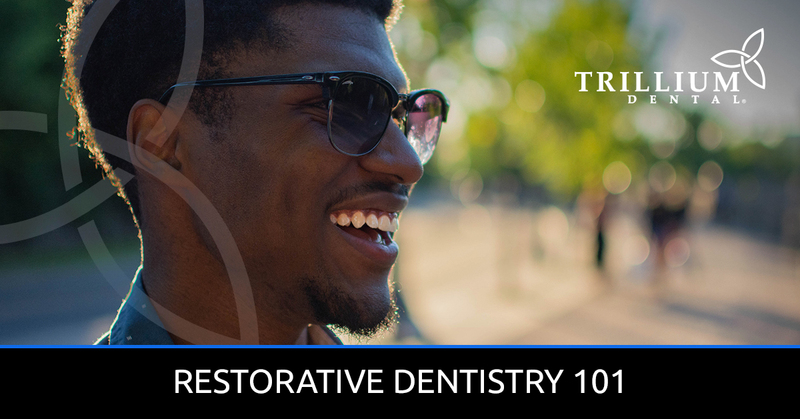 That being said, here is a little more information about the restorative dentistry procedures we offer at Trillium Dental in Ottawa. A procedure commonly performed in the field of periodontics, dental implants are a solution for many patients with missing or deteriorating teeth. At our family dental office, we offer implant-retained dentures that allow patients to eat, drink, and speak as they would with natural teeth. We do this by removing what’s left of the damaged tooth and replacing it with a small titanium post and crown by securing it to the underlying jawbone. Over time, the permanent dental implant will stimulate additional jawbone growth and result in a perfectly functioning set of teeth. Given that our Smile-In-A-Day dental implants come in the form of implant-retained dentures, they are a great alternative for people with traditional dentures. Rather than falling out and sliding around in your mouth as you speak and chew, our dental implants remain secured in place and don’t inhibit these necessary daily functions. Another component of restorative dentistry is root canal treatments, which aim to remove damaged nerve (the “pulpy” center) from the tooth. This is done by numbing the area with a local anesthetic, drilling a small hole in the tooth, and clearing out the bacteria inside. Then your dentist will fill the hole with a sealer and cap it with a dental crown to protect it from further damage, leaving you with a reinforced, functional tooth. For many reasons, patients often require either traditional or CEREC® dental crowns to cover up and protect decayed teeth from further damage. This could be a follow-up restorative dentistry procedure from root canal treatments, a component of dental bridging, or an improvement of the appearance of a tooth. At Trillium Dental, we now use CEREC® CAD-CAM technology, so the procedure can be completed in just one appointment rather than two, which is the case with traditional dental crowns. Also called fixed bridges, dental bridges are a type of prosthetic that secures fake teeth to the surrounding dental crowns (known as the anchor teeth). Dental bridges aim to support the false teeth by permanently adhering to the tooth crowns, keeping them firmly in place so that the fake tooth, or dental implant, is secure. This procedure requires two dental visits, where the first one consists of your dentist filing down the anchor teeth and capping them with temporary dental crowns and bridges, and the second one consists of your dentist replacing the temporary bridge fixture with a permanent one on the anchor teeth via dental cement. If you’d like to learn more about restorative dentistry, visit the page on our website or give us a call! Our dentists and dental hygienists at Trillium Dental in Ottawa would be happy to answer any questions you may have. And, if you think you might need a restorative dentistry procedure, don’t hesitate to request an appointment online!